Serbian police have used tear gas to clear thousands of protesters trying to blockade the residence of President Aleksandar Vucic in Belgrade. The opposition has been staging largely peaceful rallies for weeks. But tensions escalated on Saturday when crowds stormed the state TV station. Mr Vucic is a reformed extreme nationalist who now wishes to lead Serbia into the European Union. Riot police fired tear gas at the crowds that had gathered outside the presidential residence in the capital. That was the slogan the slogan of the movement that ousted Slobodan Milosevic in October 2000. Milosevic was president of Serbia and later Yugoslavia during the latter’s violent break-up in the 1990s. His government placed severe curbs on independent media. In 2001, he was transferred to The Hague to face trial on war crimes charges at the International Criminal Tribunal for the Former Yugoslavia. He was found dead in his cell in 2006, before his trial could be completed. The protest was organised as President Vucic was giving a televised address from inside his residence on Saturday’s violence. 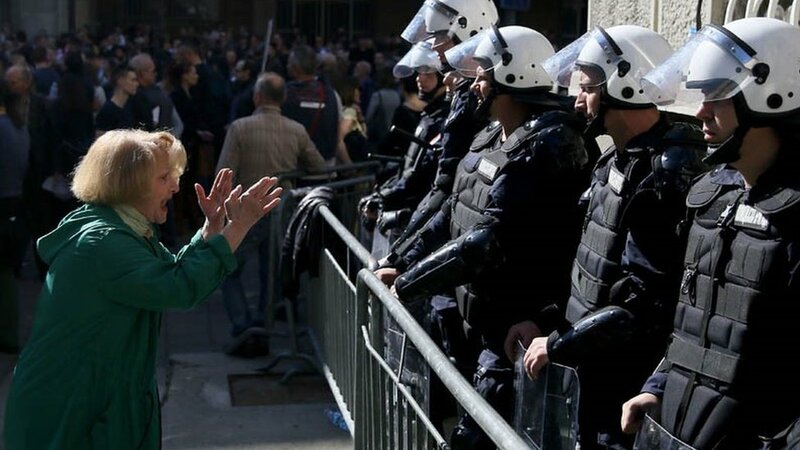 “Serbia is a democratic country, a country of law and order and Serbia will know how to respond,” the president said, branding the protesters “fascists, hooligans and thieves”. In November last year, Mr Stefanovic – leader of the Serbian Left – was beaten up and left unconscious by a group of young men in dark clothing. Opposition leaders blamed President Vucic for the attacks, and accused him of bringing back an autocratic style of rule reminiscent of the Milosevic era.